Jean Gabriel Marchand the general de division. Here represented by a Front Rank figure with a Redoubt ADC in blue. Brigade Chemineau comprising the 39e ligne (1190 men). 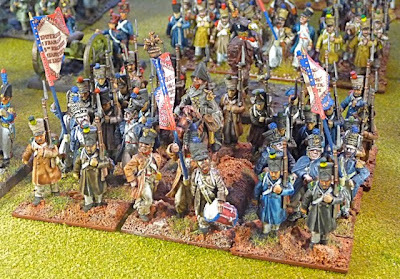 A small regiment with a mixture of Perry plastics and Elite command figures, although 3 battalions where at the Battle of Fuentes de Oñorno, I have represented with just 2 here. 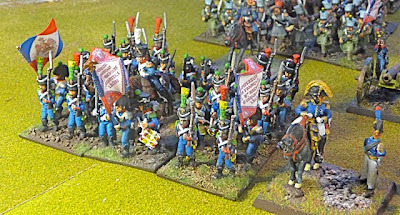 These figures are just off the painting table, maybe a little sloppy but since this was the last unit in the 6th Corps to be painted, I was getting a little fed up. and 76e ligne (1290 men). Ditto as above in respect to figures, painted about 6 months ago. General de Brigade Chemineau is a Redoubt figure (say it again, avoid these figures). Brigade Maucune with 69e ligne (1590 men). Foundry figures painted a couple of years ago, thank god we all can learn. General de Brigade Antoine Maucune is a Front Rank figure. and the 6e legere (1250 men). Foundry figures done about a year ago. Well that it for the 6th Corps, I shall post some snaps of the whole unit in a day or 2. I just saw where Victrix came out with some metal cacadores (sp?) - they look nice and might make some nice opponents for your ever growing french force. After getting my French force together, I'm going to take a break from Nappy's and paint something else for a month. Perhaps 15mm WWII or I might help my on with his 40k stuff. Of course, I may just be waiting for the rumored plastic Austrians that are supposed to come out this sumer. thanks Miles, I already have some Front Rank Cacadores, so I am set there. I am thinking of moving on to Austrians myself, not decided on the type. Very, very nice John. Your collection is starting to look mighty good (and numerous). John, if you're going Austrian I would wait a little; Radetzky, Victrix and Hat are all coming out with new ranges. 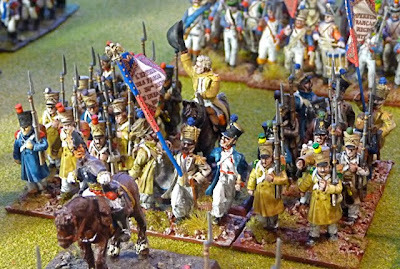 Very nice indeed, this blog is an inspiration for my own Napoleonic project :-) Those ranges seem to mix pretty well? I'm actually planning to stick with 100% Perry figures but its good to see that I could mix a few others in if I need to. Keep the updates coming, you are driving my painting along...... I want a collection just like yours! 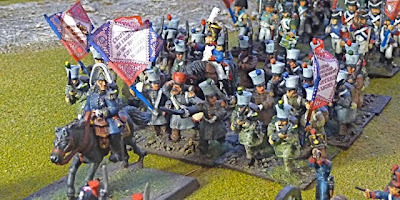 Man what a great display of figures they look awesome, I've just purchased some victrix British and intend to start them soon maybe sooner after visiting your blog.